Mr. Reginald T. A. Armour SC. is an Attorney at Law in private practice, specializing as an Advocate in the areas of commercial law, labour relations constitutional and public law and, as consultant Counsel to his clients. He was appointed a Senior Counsel by the President of Trinidad and Tobago in 2003. Mr. Armour has a wide Caribbean legal practice and, has represented his clients before the Judicial Committee of the Privy Council and, Courts of Appeal and High Courts across the Caribbean. He is the Head of Marie de Vere Chambers in Port of Spain, consisting of a Practice of eight self employed independent Attorneys, originally founded in the late 1980s by Mr. Frank Solomon SC. Additional to his law practice as an Advocate, Mr. Armour is the current President of the Law Association of Trinidad & Tobago and the Chairman of the Council of Legal Education, the regional legal body under whose auspices exist the three (3) Caribbean Law Schools in Trinidad and Tobago, Jamaica and the Bahamas. 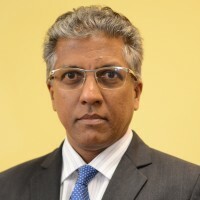 He has served as an acting Justice of Appeal in the Eastern Caribbean Supreme Court, an acting High Court Judge of the Supreme Court of Trinidad & Tobago, and is a former member of the Law Reform Commission and the Legal Aid Authority of Trinidad and Tobago, among others. In 2007, he was appointed by the President of Trinidad & Tobago to serve as Tribunal Counsel to the 2007 Mustill Tribunal and, more recently (2012) by the Chief Justice of the Eastern Caribbean Supreme Court as Tribunal Counsel in St. Lucia to the Stollmeyer Tribunal. Both of these Tribunals were constitutional Tribunals established to investigate and report on judicial misbehaviour. He has co-authored with the late Professor Ralph Carnegie a Report & Recommendations, commissioned by the Organisation of Eastern Caribbean States Secretariat and entitled National Constitutional Issues of an OECS Economic Union and, has written in the areas of public law and labour relations. He is married and the father of two daughters. Reginald T. A. Armour S.C.